Transforming workplaces requires transformational techniques. 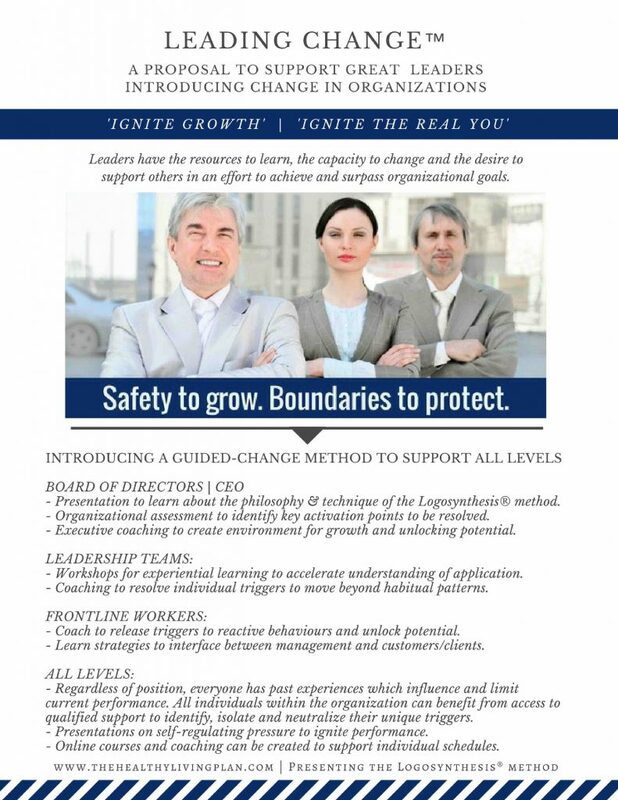 LEADING CHANGE™ Leadership Development offers a truly transformational approach. The Logosynthesis® method of guided change provides a fascinating philosophy and simple technique to support all levels within organizations. As external demands increase, it is beneficial to learn a technique that can relieve the internal pressure to create space to expand perspective and support better decision making. The only requirement is a trust in the process, a curiosity to learn and the willingness to explore the journey. Leadership has the responsibility to create trust. For trust and engagement, we all require an environment where we experience safety to grow and boundaries to protect. This is the responsibility of leadership. This can be very challenging in intense, uncertain and rapidly changing environments. We are all human. We all have emotions. And we get activated by our environment. By identifying, isolating and neutralizing the triggers, we can unlock potential in leaders and in the frontline. As we resolve the triggers that activate closed thinking, exclusive interactions and habitual patterns of behaviour, we can create an environment of trust. We also offer IGNITE THE REAL YOU™ for personal development. We each have a unique set of life experiences mixed with cultural attitudes operating in an organization that is charged with its own dynamic. But we each also have a unique purpose and passion to create. As we remove the blocks, we can create space for this passion to unfold and unlock the full potential of everyone in the organization. We learn and grow through contrast offered by others. It may be challenging and uncomfortable but if we sense trust, we are free to unlock our potential. Reach out to us to tailor a program to meet the needs of your organization.